This article originally appeared in the “Facility Cleaning & Maintenance” section of REMINetwork.com. Housekeeping staff continue to face many challenges with cleaning and disinfecting healthcare facilities because many environmental surfaces that are purchased don’t meet best practice recommendations under the Provincial Infectious Diseases Advisory Committee (PIDAC). However, PIDAC’s 3rd edition of Best Practices for Environmental Cleaning for Prevention and Control of Infections in All Health Care Settings, to be released in 2017, will place more stringent guidelines on the selection of environmental surfaces in healthcare settings. These updates are in response to research indicating that microbes live on surfaces for days, weeks and even months. Meanwhile, industry is learning that various surfaces play an active role in the transmission of organisms through direct and indirect contact with the environment and people. According to the Coalition of Healthcare Acquired Infection Reduction (CHAIR), “hospital acquired infections are a devastating health crisis that must be resolved.” More than 200,000 people in Canada will contract an infection each year and more than 10,000 will die. Although it is not known how many hospital acquired infections (HAIs) are directly related to environmental surfaces, it is believed that industry can reduce the staggering numbers of HAIs with effective cleaning and disinfecting. But it is also evident that some surfaces are not compatible with hospital grade disinfectants and break down when exposed to cleaning products and harsh disinfectants, such as sporicidal disinfectants. Surface damage may result in cracks and crevices, which may habour microbes and cause repair or replacement costs to a facility. New money is coming to healthcare facilities across Canada through the recently announced federal budget and particular provincial budgets. For instance, the Saskatchewan government announced it will maintain prior year funding of $50 million to invest in health facility maintenance and equipment. Such investments create more opportunities to select proper environmental surfaces, so tax dollars aren’t wasted and healthcare facility occupants are kept safe. At the time, the PIDAC committee wanted to emphasize this point, to ensure healthcare purchasing practices consider the importance of selecting finishes that are cleanable and stand up to hospital grade disinfectants. Unfortunately, some interior designers, healthcare leaders and decision makers are not educated on the importance of surface selection and select surfaces based on aesthetics and design alone. Design and aesthetics are important, but if materials cannot be cleaned or disinfected, the risk of HAI’s through environmental microbial transmission increases. In order to address the balance of design, aesthetics and cleanability, it is recommended that environmental services and occupational health and infection prevention professionals be part of the selection process for finishes and surfaces. 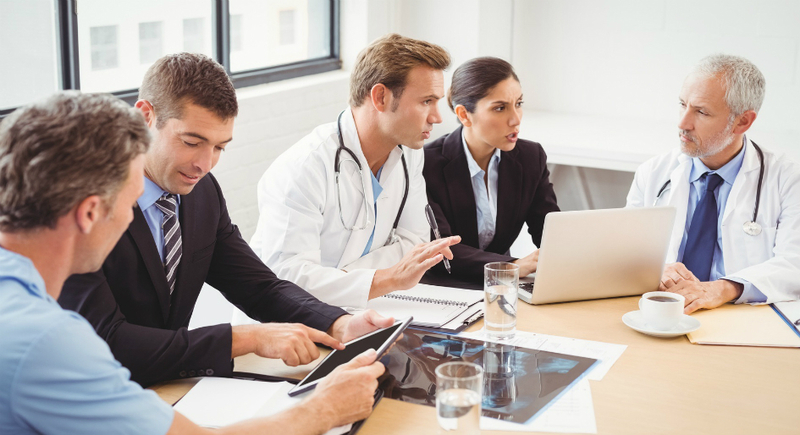 These key stakeholders need to work collaboratively within their healthcare system to stop items from arriving in clinical settings that cannot be cleaned and disinfected. If facilities haven’t done so already, they should implement a product evaluation and product standardization committee with these key stakeholders as active members, ones who can help educate decision makers on the impact environmental surfaces have with regards to cleaning, disinfecting and HAIs. Clear purchasing policy statements will also ensure that hard-to-clean items do not arrive in healthcare facilities. Some facilities reference the PIDAC document on environmental surfaces section in their RFPs for new furniture and other required environmental surfaces, but, unfortunately, not all facilities involve key stakeholders in environmental surfaces selection or have policies and/or a product evaluation committee. A new Ontario-based facility recently announced the development of a new labour, delivery and post-partum room, featuring warm and natural wood accents. Wood is an example of an organic material that contains moisture and should be avoided in clinical areas. Because of its porous nature, industry cannot be certain that hard surface disinfectants will effectively disinfect the wood surface. Creating an environment of warmth and comfort in such spaces is important; however aesthetics should not supersede infection prevention and cleanabilty. In such cases, it is hoped that selection committees involve an environmental services manager, an infection prevention professional and/or an occupational health nurse. On a recent visit to a large acute care emergency department in Ontario, there were many items of infection concern in the isolation room. These items included cracked vinyl seating, a rusted IV pole, wood items, and a creative disposable waxed paper roll, which was tied together with gauze bandage at the foot of the stretcher bed. This was a modified version of a disposable wax paper dispenser commonly used on examination tables. All of these items have potential reservoirs to harbour microbes and are difficult or impossible to clean and disinfect. This was an isolation area of an emergency room. Isolation rooms are designed to house patients with infectious diseases, with the objective of preventing the spread of infections. Items that cannot be cleaned and disinfected have no purpose in isolation rooms, clinical areas and any area where immunocompromised patients are present. Routine environmental audits will identify these issues in healthcare and position a facility to work towards replacing items; however, many facilities struggle with funding replacement and repair costs. Perhaps these funds would not be as needed if decision makers made more informed choices and purchased items that performed well with routine cleaning and disinfection. Such is the case with cloth furnishings that harbour a higher concentration of fungi than non-porous furnishings. Bacteria cannot be effectively removed from upholstered furniture. PIDAC recommends that an alternative to cloth surfaces must be used in care areas. When using upholstered furniture, it is recommended to cover it with fluid-resistant, non-porous fabric that stands up to hospital grade disinfectants. Seams in hospital furniture can harbour pathogens even after being cleaning and disinfected in accordance with proper cleaning standards. 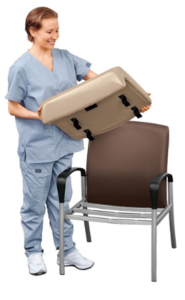 In 2014, an independent laboratory study was conducted by healtHcentric, a divison of ergoCentric, a North American designer and manufacturer of high-quality ergonomic chairs, proving that a piece of seamed, healthcare-grade vinyl, cleaned and disinfected with a hospital grade disinfectant, only achieved 58.08 percent removal of microorganisms—equivalent to a 0.4 log reduction. This same study demonstrated that a piece of seamless IC+ Upholstery Solution by healtHcentric achieved a 98.68 percent removal of the microorganisms—equivalent to a 3 log reduction. Findings pointed out that seamless non-porous surfaces are easier to clean and disinfect. Furnishings with removable parts, such as seats on chairs, should be considered in the selection process, as well as removable seats to enhance cleaning and disinfection ability. Environmental surfaces that are easy to clean and disinfect will assist housekeeping staff in maintaining a clean safe environment for all occupants and visitors within Canada’s healthcare facilities.